This promotion for 2017 has ended. However, you can contact us for a consultation anytime through the contact form! This holiday season, treat a loved one, a friend or yourself to the gift of a home remodel consultation. We spend so much time in our homes and we are often daydreaming about changes we would make or updates or adding on to make more space. The process of figuring out which changes make sense and which are more complicated (and expensive) can be an endless task without the right tools and ability to “see” the potential. For anyone who has been ruminating but has not taken that first step of talking to a residential design professional, this is an ideal gift! 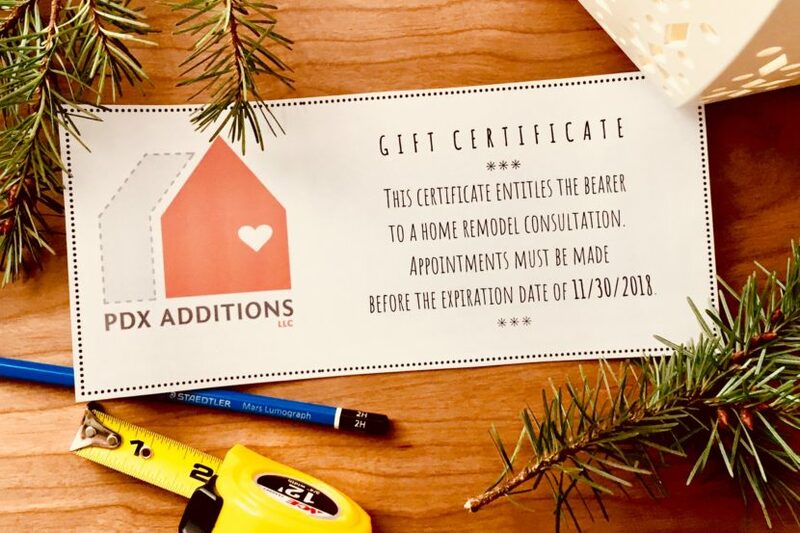 For the month of December only, for $99, you can get a home remodel consultation gift certificate. This is a great value* and the recipient will get a 1-2 hour on-site consultation and then a follow-up report which will outline specific needs and which options are available and make sense. Report may include zoning research if that is pertinent to the project. The recipient will walk away from this consultation process feeling educated and armed with a lot more information about their home and a fuller understanding of the process involved in undertaking a remodel, renovation or addition project. We will follow-up via the email provided in your PayPal checkout profile so make sure it is correct. Please allow up to 2 business days to receive your confirmation and a downloadable gift certificate for printing or sharing. If you have any questions, please send an email via our contact form and we will get back to you shortly. The certificate expires on 11/30/2018. An appointment must be made before that date. Please note: We generally keep our work to the Portland Metro Area under the permitting jurisdiction of City of Portland. If you are outside of that area, please using the contact form so we can discuss options. *The value of this certificate varies. We price our consultations to the scope of the project. Some projects require a more extensive consultation and research. The $99 price represents a savings of 25% to 300% off a regularly priced consultation.